As a professional photographer, I've had the incredible opportunity to photograph some of the most beautiful places in the world. My work has been featured in travel guides, magazines, websites, marketing materials, catalogs and more. I've returned to Phoenix and am here to offer my expert eye to help you sell/rent your home and/or vacation rental. Why use a professional photographer for your Real Estate photos? The answer is simple: better pictures = more interest = more traffic = faster sales! Every property I shoot is important to me, whether a multi-million dollar home or modest town house. I'll shoot the high quality photographs that get your home noticed. For a limited time, enjoy $10 off your first shoot! Breathtaking mountain views with a great location within Anthem. Walk into a Beautiful house with breezy floor plan and 10' high ceiling. 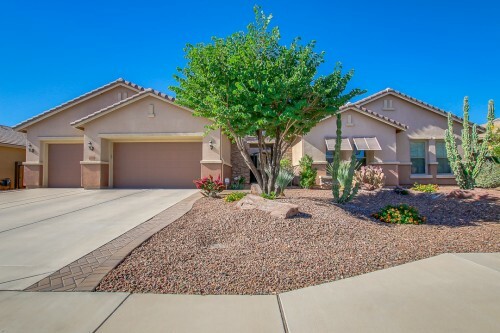 This 5 bed, 3.5 bath home showcases stunning exterior with natural desert landscape and fabulous interior featuring carpet and tile floors, spacious living and dining areas, and charming kitchen boasting plenty of cabinets w/crown molding, stainless appliances, granite counters w/breakfast bar. The master bath featuring granite double sinks, separate tub and shower, and large walk-in closet. The backyard is a wonderful place to relax in surrounded by stunning mountain views and has multiple seating w/a gazebo. Owner spent more than $66,000 on the upgrade. Don't wait make this home your own for the holidays. Ready-to-go workspace with the widest possible range of complementary support services available on demand, Regus offices give you all you need to start work immediately and offer an efficient alternative to traditional office spaces. Whether you need an office for a day, month or year we have options call to see how you can get a free office day. Looking to lease an office or buy an office building? See attached for a quick snapshot of Scottsdale market trends. My name is Mike Hernandez and I am excited to be joining Amy Hill with Phoenix Central Realty. I bring over 30 years of customer service experience to Phoenix Central Realty. Being a married man with three daughters of my own, I understand the importance of finding the perfect home for a buyer because a home is not just a roof over one’s head, but a place for memories to flourish. Having bought and sold my own family’s homes here in the valley, as well as purchasing investment properties, I know that I am not only qualified to give you the best selling experience, but that I have personal experience in real state. This insight will help me guide someone buying or selling their first home, or even keeping seasoned home-buyers on track for their purchase. I hope to earn your trust and loyalty.